Cycle Hire in Port Erin, Isle of Man. Erin Bike Hut is a friendly, independent bike shop in Port Erin, on the south coast of the beautiful Isle of Man. We are located on Church Road, just behind Franklin’s car show room and within sight of Port Erin railway station and Port Erin bus station. Want to see what our cycle hire customers have said about us? Click on the logo to read the reviews! When it comes to cycling in our neighbourhood we know what’s what so we have a fleet of Orbea Avant H50 road bikes and Orbea MX50 mountain bikes in a variety of sizes to suit all shapes and sizes plus a Orbea Orca M20i road race weapon! Choice of 27.5″ (Small / Medium) and 29″ (Large / X-Large): Click here for mountain bike size guide. Lightweight aluminium frame with internal cable routing. 100mm travel fork with lockout and preload adjustment. Hydraulic disc brakes, for reliable all weather braking. Hydroformed triple butted aluminium frame with endurance road geometry. Carbon fibre forks with aluminum steerer. 50/34T road compact gearing with wide range 11-32 rear cassette. Orbea Avant endurance road bikes are specifically designed to blend performance with ‘ride all day’ comfort. Orbea OME monocoque carbon frame and forks with performance road geometry. 50/34T road compact gearing with wide range 11-28 rear cassette. Vision Team 30 Comp wheels. Please note, this bike is only available in size 55cm. We supply a helmet and lock with each bike and a repair kit (pump, spare inner tube, tools) with each group. Pedal Hire – £10 (Shimano SPD & SPD-SL pedals available, please specify which type you require) You’re also welcome to bring your own pedals! Pannier racks available (MTB only) please enquire for price. Bring photo ID (passport, drivers licence). We also take a photograph of you. Bring a valid debit or credit card with sufficient capacity for the security deposit of £100 per bike. This is refunded once the bike is returned. Any damages will be taken from the deposit. However I am fair and understand that bikes are there to be used, not polished, so wont bother you for minor issues. We can also arrange same day ‘walk-in’ cycle hire subject to bikes being available. Simply fill out the form below, call 01624 835484, or visit us in the shop to arrange hire. What dates are you looking to hire the bikes? Orbea MX50 Entrance Mountain Bike - what sizes do you require? Orbea MX50 Mountain Bike - what sizes do you require? 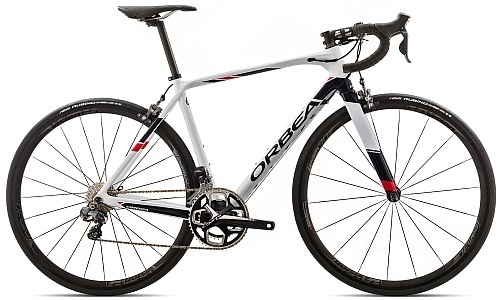 Orbea Avant H50 Road Bike - what sizes do you require?